To one out of every four human beings on the face of the planet, that day is only the date of an event from history. More than 25 percent of the world’s people are under 15 years of age. They weren’t even born yet on that day. On the 11th of September, 2001. The day that began so brilliantly. And ended in such unimaginable tragedy. It was a gorgeous day, that day, 15 years ago today. One of those amazing fall days with deep blue skies and brilliant sunshine that makes you glad to be alive. And then… and then… the world changed. • At 8:46 a.m., 15 years ago today, American Airlines Flight 11 out of Boston, Massachusetts, crashed into the north tower of the World Trade Center. • At 9:03 a.m., 15 years ago today, United Airlines Flight 175 from Boston crashed into the south tower of the World Trade Center and exploded. Both buildings were burning. • At 9:37 a.m., 15 years ago today, American Airlines Flight 77 out of Washington Dulles, crashed into the western side of the Pentagon and exploded. All on board and 125 in the Pentagon were killed. • At 9:59 a.m., 15 years ago today, the south tower of the World Trade Center collapsed, crashing into the streets below. • At 10:03 a.m., 15 years ago today, United Airlines Flight 93 was crashed by its hijackers into a field in Pennsylvania after the passengers made a desperate attempt to retake the aircraft. All on board died. • At 10:29 a.m., 15 years ago today, the World Trade Center’s north tower collapsed from the top down. A cloud of ash turned day to night in the narrow streets of lower Manhattan. Nearly three thousand lives ended that day, 15 years ago today. They died in an instant, vaporized by fireballs. They died long agonizing terrifying minutes later, trapped in the smoke and the flames. They died jumping from the upper floors of the Twin Towers. They died in the Pentagon. They died in a field in Pennsylvania. Those of us who were alive that day remember it all. We remember as though it happened yesterday. But it was 15 years ago. Fifteen years. Fifteen years. More than a lifetime for some 26 percent of the human population. Time enough that, you might think, the wounds would have begun to heal. There was a time, just after that day, when it did seem as though some things had changed for the better. When so many of us seemed to care more, to reach out more, to consider how very precious are the lives of those we love and how little it might take to lose those people in a blinding flash of an instant. We seemed to be taking time to say those very difficult words more often: “I love you.” And we even seemed to mean them more. But … but… but the truth is, my eyes are still full of tears. I look at this election season, and the deep division it is exposing in the nation I love, and I can’t help but weep. The country the terrorists attacked is one I don’t see much anymore — a place where people read, and asked questions, and challenged ways of thinking, and rejected closed minds, and protected human rights and civil rights, and abided by and valued the rule of law. It was a place where justice was to be achieved at the ballot box and in the courtroom — not by pointing a gun or blowing up a building. Where dissent was valued and the right to dissent was sacrosanct. It was a country where we strove to make everyone equal under the law, where opportunity did not depend on race or gender. It was a country of tolerance, and charity, and love. Love of country, love of family, love of freedom. Today, and every year on this day, I must do what I swore I would do, 15 years ago, as I walked with my friend Toni through the streets of lower Manhattan, and stared at the posters with the faces of the missing, and at the empty firehouses, and at the twisted steel girders. Speechless and in tears. I remember! A very powerful post, and emotional post. 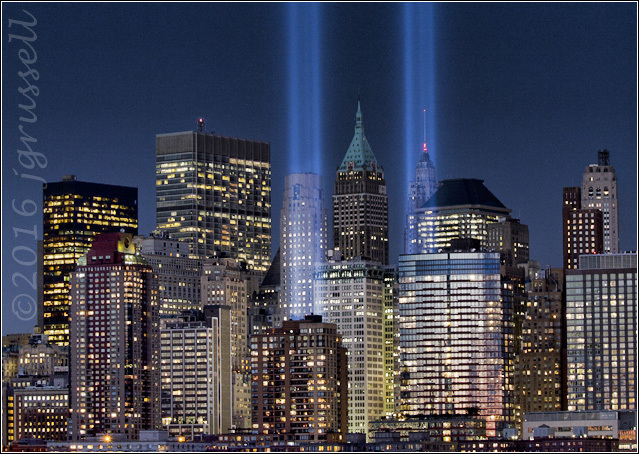 We also remember…getting a phone call that made no sense in the wee hours of the night..turn on the TV a plane has crashed into the World Trade Centre. Our adult children arriving in a rush to watch on cable as it happened again, the shock as those huge buildings disintegrated. The voices of the journos in disbelieving shock. The sheer horror of it all. And yet we were on the other side of the world, not nearby. And yet….to succumb to hatred and fear is to give the terrorists even more power for harm: to individuals, to nations, and to the world. We must stand strong against those attitudes wherever we live. All manner of people lost their lives. We must remember that all lives matter. Eloquence about something so terrible. I remember. Walking into work after a night in my new house without TV or computer to find a TV on at work. We had an American student there whose parents were both flight attendants and she couldn’t get through to them or anyone else. My neighbour whose cousin was missing and whose DNA was not confirmed for so, so long. For all who helped, all who were lost none should ever forget. My husband and I were on the way to France when this tragedy unfolded. The “line” drawn in the ocean between those planes which would be allowed to finish their flights and those who would be turned back must have just brushed the tail of our plane. We were not told of the tragedy, but it began to be known to us when we reached our small airport hotel room and turned on the TV. It was a difficult ten days of wanting to be back home and not knowing when we would be able to do that. The events of that day are never far from my mind! As usual you have a wonderful way with words. To express what we all feel is so difficult and yet you do it so well. I remember, Judy. For those of us who lived and watched the events of that day, how can we forget? Thank you for your eloquent remembrance. Judy, the above was written by a cousin of my sister-in-law. Sharon said verbally that she welcomes having her poem shared, as long as her name stays with it.